Day 25: Oz itinerary – How to plan a 30-day cycling tour. Finally! After 80+-hour spent in book reading, region research, map shuffling and route picking, here is the 30 days Australia cycling route itinerary (PDF) for you to download. It contains a detailed town-to-town tour plan, with “from-to-distance” information for each leg, nice map and elevation graph. I’m pretty happy with this. Here are the steps to prepare an itinerary like this. Goal: List cities to visit. To get an good overview of the country, figure out you’d like to visit. Like almost all planning, this will be part of an iterative process since in later steps, you’ll always be forced to decide which route to give up . How: Do a google search on australia tourism, read the wikipedia or wikitravel entry for the whole country and major cities you. Or buy the Lonely Planet Australia Country guide book and read the introduction section. Example: For me, I feel Sydney, Brisbane, Cairns, Canberra, Melbourne, Adelaide, Perth and Darwin are all quite interesting to visit. Goal: Figure out how to go to each one by cycling. How: For a visitor, it’s always challenging to get some concrete idea on which route to take and what does that feel like. Crazyguyonabike is very helpful to get the ‘experience’ things right for you. Crazyguyonabike.com is a place to find cycling tour journals. Most journals are well written with nice pictures and distance information neatly sorted out. It’ll provide solid ideas of each trip, like the Princes Hwy could become quite narrow without any shoulders from Portland to Adelaide. Or, in March the temperatures of Marlee region could still get as high as 35C. Goal: To pull all information together to work out a plan with at least “From, To, Distance” information for each day. 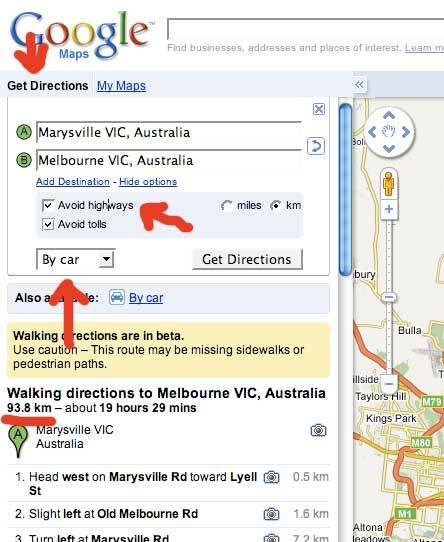 How: Based on the step 2’s town research, use Google Map to get the distance from town A to town B. Remember to check the “Avoid Highway” in More Options so that we won’t end up riding on motorway. Example: This route planning process made me realize that even a “modest” route like “Sydney to Adelaide” is still too long to cover within 30 days. After lots of reading and head scratching, I found that in order to cover Adelaide, I’ll need at least 37 days. It was painful but clear that I have no choice to cross Adelaide out. Goal: Plot the key towns onto map and use elevation graph as a double check. How: Calculate the distance and elevation up-and-down for every single day to make sure that you haven’t pushed yourself too agressively. This used to be quite tedious and time consuming. But with bikely.com, it has become much easier. Go register an account and start drawing, click each town in the order you have worked out in step 3 and the service will automatically fill out the rest route details for you. By the end of the process, you’ll end up with a quite nice route map and elevation graph like the one showing above. Example: Here are the two maps I’ve created: Sydney to Melbourne and Melbourne to Halls Gap via Great Ocean Way. I have tried to plot the map using Google Earth, but bikely is much more simpler when you have the needs to generate the elevation map, whereas in Google Earth I just couldn’t find a way to do so. Posted on January 20, 2009 January 24, 2009 Author 野狼 / Alex DongCategories EnglishLeave a comment on Day 25: Oz itinerary – How to plan a 30-day cycling tour. Had a fairly good rest today: enjoyed a fine dinner, finished a science fiction book, watched an interesting movie and had some interesting phone conversation with friends. The movie is The Queen. It captured what happened in Britain in the first week after Diana’s death. Mostly from both the Queen’s perspective and Tony Blaire’s. The relationship between the Royal family, especially the Queen, and the government surprised me. The whole topic of Constitutional Monarchy, the dynamic between the permanent King or Queen and the elected government leader is *just* intriguing. Although it might be something people in UK, OZ, NZ or Canada have been quite familiar, it’s just so foreign to me, someone in a country where the world history was focused in rebellion rather than political changes. Last but not least, the phone call from friends. One of them strongly suggested us to take the trip from French all the way to Istanbul. “Just to get experience of culture diversity”. Also the shorten the stay in US “since it’s culturely unified”. Human being is such an interesting creature. I could still remember the excitement on Day 1 when we realized the possibility of this one year trip. But as time slides by, the excitement ebbs while tremendous teeny-tiny things seems to over-whelm us. Endless visa application for just one country. Cycling route planning for every single day. I’m a big fan of Standford Entrepreneur through Leadership podcast, today Stan Christensen’s The Art of Negotiation really gave me a happy surprise. He talked about his experience as a traveler in Los Angels or sitting in the back of NYC cab to show how the core idea of negotiation goes into our everyday life. Even more important, he explains that the essence of Negotiation is not grab a larger share of a pie, but to build long-term relationship. He also brought up two principles: objective reference and alternatives. This might be a bit off topic for this travel blog, but I am pretty sure that we’ll have some serious chance to practice what we’ve learned here. Tons of things have happened in past a few days. I should have updated this blog more often, my bad. We have prepared all the materials the official tourism visa website requires, but yesterday afternoon, a lady in Oz’s Shanghai office called us up and asked for a detailed itinerary, company’s approval of leave request, Zephyr’s experiences as a freelancer and flight reservation information. We finished up all the paperwork yesterday afternoon but their fax machine seems to have some weird problems of accepting more than three pages. When I get back to home, it’s already 9pm. This morning, we managed to get the papers fax out via two different numbers, but another phone call from Oz embassy said they only got the first two pages. Z finally found out that it’s possible to scan the paper and send those supplementary as images via email to the visa office. To me, this is simply ridiculous. Technically speaking, fax is less trustworthy yet much more expensive than email, uneasy to process and archive. But the official procedures seems to have hard coded the fax concept deep into their brain. I know it’s just impractical to issue a private/public key pair for all citizens, but for those who have the knowledge/skill to use them, why not? Oh, forgot to mention this: there is an electronic material submission gateway on the official website, but Chinese citizens have to go through the old process. Wondering why. If you’re following our tour planning process, you’ll notice that at the very beginning, we were thinking of covering all 6 continents including Africa and South America. But a careful budget planning shows that we’ll have only $40/day, which should cover food, accommodation, commute, basically everything except flight ticket. In our last post, I wrote about sponsorship. It turned out that the financial crisis is making most companies nervous enough to freeze their marketing budget for 2009. So given current situation, it’s essentially impossible to get significant sponsorship within one month or two. A traditional business problem: how to increase net profit if the revenue is fixed. The two changes above has successfully lifted our daily budget from $40 to $72 per day. Less is more, isn’t it? Third: start thinking of cycling. One purpose of this world tour is to get to know each country. Fly around is definitely the best way. Neither car rental. The car offers a psychological protection shield that will bounce off lots of ‘accidental events’, which is actually the most interesting thing in travel. We have thought about hitchhiking since it’ll give a perfect chance for us to spend long enough hours to talk to local people. It will also make the trip full of randomness. But a couple of friends have raised safety concerns which really worries Z. On last Sunday afternoon, I suddenly realized that we could cycling around with our camping equipments loaded. This way, we could move slow enough to really see a country, open enough to meet local people and cost efficient enough for us to feel comfortable enough to depart without worrying of capital shortage. More on tour planning tomorrow. Are there any way to get more funding? But after our phone call, Z and I decided to give it a try? If we could raise another CNY 300,000, ie USD 43,950, we’ll have $160 per day for one year or $80 for two years. That is whole lot better. 0) Brainstorm a core theme for this trip. It should be something that’s relevant to my software and entrepreneur background that could make the whole plan credible. It should be deep and serious enough that could evoke thinking and discussion. It should also be interesting enough to the people the sponsors is willing to spend their marketing dollar on. 2) Find a couple of media as a platform to get the messages out. The bigger, the better. The goal of working with media is not to get the money, but to have a channel into the target audiences. The wider the coverage, the more lucrative it is to the potential sponsors. 3) Contact potential sponsors. The situation has to be a win-win for all three players: us, the media and the sponsor company. 4) Once the major deal is closed, we could talk to Camera manufactures, Outdoor gadget or equipment companies to figure out other relatively small items. This sounds quite interesting. The worst case is that we might end up with no sponsorship at all. But through this process, we should have a clear and concrete idea of what we really want to see in this trip. Plus I could gain some first-hand experience in fund-raising. Doesn’t sound like a bad choice, right? Tomorrow: call some media and marketing friends and figure out a time to get people together for a brainstorm session. Find local labor works like fruit picking. Work for the hostels we’ll stay at in exchange of free beds and food. Sell photograph or travel writings online. Stay at people’s apartment or houses to save on lodging. Buy fish, vegetables in wet market outside urban area and cook our own meals. Stay in tents in rural areas. Hitchhike or share cars with others.